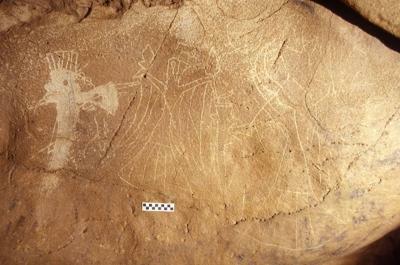 This art features a bird holding ceremonial maces and a ceremonial monolithic axe transforming into a human face. Jan Simek, Alan Cressler, Nicholas Herrmann and Sarah Sherwood/Antiquity Publications Ltd. Recently, the discoveries of prehistoric rock art have become more common. With these discoveries comes a single giant one—all these drawing and engravings map the prehistoric peoples' cosmological world. The research led by Simek, president emeritus of the UT system and a distinguished professor of science, is published in this month's edition of the journal Antiquity. The paper is co-authored by Nick Herrmann of Mississippi State University, Alan Cressler of the U.S. Geological Survey and Sarah Sherwood of The University of the South. "Our findings provide a window into what Native American societies were like beginning more than 6,000 years ago," said Simek. "They tell us that the prehistoric peoples in the Cumberland Plateau, a section of the Appalachian Mountains, used the rather distinctive upland environment to map their conceptual universe onto the natural world in which they lived." Simek and his team analyzed 44 open- air art sites where the art is exposed to light and 50 cave art sites in the Cumberland Plateau using nondestructive, high-tech tools, such as a high-resolution laser scanner. Through analysis of the depictions, colors, and spatial organization, they found that the sites mimic the Southeastern native people's cosmological principles. "The cosmological divisions of the universe were mapped onto the physical landscape using the relief of the Cumberland Plateau as a topographic canvas," said Simek. The "upper world" included celestial bodies and weather forces personified in mythic characters that exerted influences on the human situation. Mostly open-air art sites located in high elevations touched by the sun and stars feature these images. Many of the images are drawn in the color red, which was associated with life. The "middle world" represented the natural world. A mixture of open air and cave art sites hug the middle of the plateau and feature images of people, plants and animals of mostly secular character. The "lower world" was characterized by darkness and danger, and was associated with death, transformation and renewal. The art sites, predominantly found in caves, feature otherworldly characters, supernatural serpents and dogs that accompanied dead humans on the path of souls. The inclusion of creatures such as birds and fish that could cross the three layers represents the belief that the boundaries were permeable. Many of these images are depicted in the color black, which was associated with death. "This layered universe was a stage for a variety of actors that included heroes, monsters and creatures that could cross between the levels," Simek said.